On Second Scoop: Ice Cream Reviews: How do you feel about edible cookie dough? How do you feel about edible cookie dough? Alright, who wants to admit to eating way too much pre-made cookie dough when they were younger? I'm raising my hand in case you can't see me (and if you can see me, that's a little weird). Anyway, I adore cookie dough but like most, the FDA has scared me away from eating it. 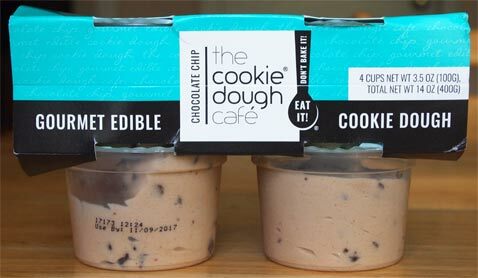 In recent years, we've slowly seen "edible cookie dough" become a thing, but for some strange reason, I didn't try it until today. I actually bought this from Walmart of all places. They also had this brand in a larger pint size, but the pints carry a cross contamination warning. I also liked that these are smaller individual servings so I can space them out as either stand alone snacks or as part of a sundae. Does that not look awesome? It tastes pretty great too. If I had to force myself to complain, I might say that they are just a smidge too dry or flour-y but honestly, you won't care. I broke my first container into two servings (noon and night) and I barely even thought about that smidge of dryness on the second half. These are absolutely delightful and I can't believe I haven't tried this idea sooner. What can I say? Sometimes the to-do list gets a little too long. So, have you tried edible cookie dough yet? If you have tried it, what do you think? If you haven't, why not? I think part of me was afraid I would just inhale it but I actually did a good job slow scooping and breaking the "single serving" into two treats. I'll try it with ice cream at some point soon but for now I wanted to throw out a big thumbs up and see what everyone else thought. Here's the real question: Have you had deep fried edible cookie dough? i tried this recently for the first time. i've seen various brands over the past year or so, but I always just thought it was weird. Then I saw a monster cookie dough version with M&M's and some other stuff and I had to try it. I ended up loving it and subsequently bought the chocolate chip and birthday cake flavors. And they aren't cheap! $6.99 at The Fresh Market. But I just take a big scoop on a regular spoon and put it back, so in that aspect its a much more controllable treat for me than ice cream! I'm a major fan of CookieDO NYC. @Chris: somebody get Dude Foods on it! @Nick: that's the other one I couldn't think of, thanks for the reminder! I'll put that on my shopping list. 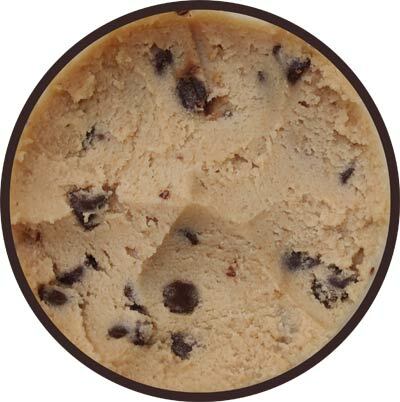 Around my area, the only one I've seen is Hampton Creek's "Just Cookie Dough" in chocolate chip. But I never got around to buying it...Now that I know they make a "cake batter" version, I'll have to get on that though. I went to the DO cookie dough shop. Got one scoop of the smores cookie dough. Too rich and too sweet! So heavy that I couldn't finish in one sitting. Ate 1/4 of it and saved for later. Cookie dough is yummy but too much of it I could break up some and mix with yogurt or crumble over some berries. Some people ordered 3 scoops!!!! That is extreme right there. My issue with the cookie doughs I have tasted are it tastes more like cookie dough cream cheese than it does cookie dough. Like Philadelphia Cream Cheese should be selling it not these other brands. And why exactly are raw eggs frowned upon when we eat mayo? I still don't get it? @Aleksandr: THREE SCOOPS? Wow. I adore cookie dough but I think I would explode. @TheIcon: do you remember which brands they were? I read recently it isn't just raw eggs that are a problem in eating raw cookie dough but uncooked FLOUR is a problem as well. There was a flour recall semi-recently due to e-coli...which needs heat to kill. The flour needs to be heat-treated to be safe to eat apparently. Id love to see the numbers on people that have eaten cookie dough and got sick vs other foods etc. Not cookie dough related but are you going to try the new Skinny Cow low cal ice creams? I haven't seen them in my area but would love to read a review on them. It's good to see more companies getting into the act but the price point seems to remain high. I agree 3 scoops is way too much and it was on a flavored cone so that added more junk. It would be nice usage for fruit tart maybe. @Anon: with just 80-90 calories per serving yet loaded with protein, the new skinny cow ice cream looks like yet another Halo Top competitor aka it's going to be filled with replacement sugars which do not agree with me. @Aleksandr: don't know if I've ever done cookie dough and something fruity, not sure how I feel about that, I guess it depends on the specific combo. I think sugar cookie dough will fit well with fruits.